Everyday I have the radio on while I am working in the kitchen or when I am exercising. East FM Kenya is one of my best radio stations. The hindi songs vary from the modern to purana geet. What makes the radio station enjoyable is not just the selection of the songs but also the radio jockeys or hosts. This morning while getting breakfast ready Seema and Aleem the morning hosts, were discussing about Facebook. They have a knack of picking very interesting topics for discussions. I love listening to them.So the discussion was what people use the Facebook for. Some love advertising what they are doing every minute, some love to bombard people with all sorts of quotes and advises. Some use Facebook to download selfies and how good they look. Some use it purely to advertise their business and some use it to show off their hobbies. The worst are the attention seekers, when they still presume they are teenagers looking for love. Whatever one uses Facebook for again everyone should follow some etiquette and know when they are crossing their limits. Many may argue that I can put up whatever I want on my timeline. But that is not the case as one has to be aware that it might offend or hurt the readers. Every form of communication is good within its limit. Today’s recipe is a simple but filling and delicious salad. I mixed mango and avocado to make it into a light but filling salad for dinner. I would have loved to add arugula but didn’t find any so lettuce it had to be. Check out the simple recipe. Missing from the picture is the onion… forgot to add it when I took the photo. Do you check your Facebook several times during the day? Peel and cube the avocado and mango.Sprinkle lemon juice over the avocado. Put the sliced onion, avocado, mango and lettuce in a bowl and toss. Use arugula or baby spinach instead of lettuce. Add a dressing of your choice. Always add lemon juice to cut avocado to prevent it from turning black. 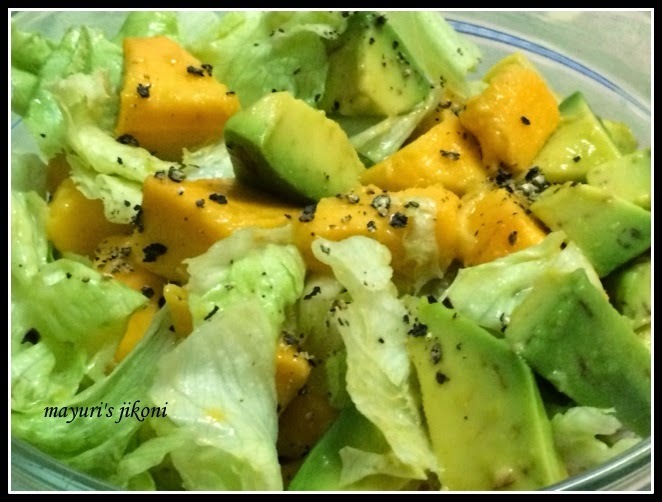 Mango and avocado, both are my favourite.. so I will surely make this salad. What a lovely and colourful salad. with regard to face book, some people post status for attention seeking that annoys me and I never encourage them by commenting or liking the status. Nice combo! Worth a try. Thanks for sharing. Thanks Shobha, my favourite fruits too.